White-tailed prairie dogs are being reconsidered for endangered species listing. A vaccine to protect prairie dogs from sylvatic plague may help keep populations stable enough to keep them off the endangered species list. Photo courtesy U.S. Fish and Wildlife Service. With 129,000 acres of deeded and leased ground to his name, Lenox Baker figures he can spare a few for prairie dogs, and, he hopes, black footed ferrets. Baker bought the historic Pitchfork Ranch near Meeteetsee, Wyoming, in 1999 and has made both the ecology and the economics priorities. Baker, a retired heart surgeon from Virginia, runs 1,320 mother cows with the help of some capable ranch managers and hired hands. “I’ve learned a lot,” he says. In addition to more than doubling the herd size in the last few years, since the last drought, Baker has been working with Wyoming Fish and Game on a vaccine for prairie dogs. That sounds counter-intuitive to many ranchers—usually the goal is to control them, not encourage the populations. However, the vaccine has its place, says Zack Walker, the nongame supervisor for Wyoming Game and Fish. The prairie dog vaccine study is in its third year on the Pitchfork. The vaccine was developed for use in animals by Tonie Rocke, a research epizootiologist with the U.S. Geological Survey’s National Wildlife Health Center. “I hope, should this work and we get adequate prairie dog numbers over a wide enough area, they’re going to release black-footed ferrets back out here,” Baker said. The black-footed ferrets were thought to have been extinct, but a population was found on the Pitchfork in the early 1980s, when the neighbor’s dog brought one to the house. The ferrets in captivity and the ones that have been reintroduced came from the population on the Pitchfork. Approximately 500 black-footed ferrets live in the wild now, but ferret recovery efforts are hampered in part by plague outbreaks. The Wyoming Game and Fish Department is teaming up with 24 other states, federal agencies, tribes and non-governmental organizations to test the vaccine. Testing has been going at 29 sites in seven states over the past few years, according to a press release from WGFD. The goal of the vaccine is to protect prairie dogs against the sylvatic plague. Sylvatic plague is caused by the same flea-borne bacteria that causes bubonic plague, which is commonly thought to be the root of the “Black Death” that killed millions in Europe in the 14th century. The bacteria was brought to the U.S. in the late 19th century and spread through rodents from the West Coast. According to the USGS, prairie dog colonies generally have an average of 90 percent mortality when struck by sylvatic plague, since they have no natural immunity to it. Walker said the catalyst for a plague outbreak isn’t clear, but it generally coincides with increased population densities in prairie dog towns. Right now, when a prairie dog town is infected with plague, it kills out most of the town, leaving the hardiest prairie dogs. If the vaccine is successful, in the absence of the plague, Walker speculates, the prairie dogs will disperse when their populations get too dense. At that point, he said, they will implement control measures to keep the prairie dogs from areas where they are not welcome. With the endangered black-footed ferret depending on prairie dogs to survive, and some species of prairie dogs being considered for “threatened” or “endangered” status by the U.S. Fish and Wildlife Service, the prairie dog vaccine may give managers another tool to stabilize prairie dog populations. The vaccine is delivered orally, in baits that are peanut butter-flavored. It appears the prairie dogs are partial to peanut butter, since the baits disappear in a matter of a day or two. Researchers then collect blood samples to see if there is an increased immune response. The results are inconclusive so far, Walker said. The vaccine was originally developed for people, but has been adapted for animals. Walker says the vaccine may have further implications for outbreaks of plague in places where there is a great deal of human-rodent interaction. The vaccine could also help keep some species from an endangered species listing. Wyoming and several other states are in the midst of a wide-spread project to map populations of white-tailed prairie dogs. 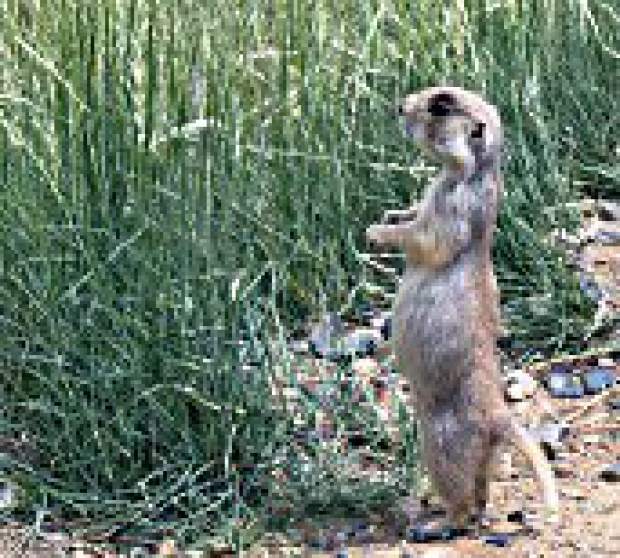 The white-tailed prairie dog was denied for listing under the Endangered Species Act in 2010, but conservation groups are challenging the ruling, so the states have to address those issues. Walker said Wyoming’s share of the mapping project will cost $184,000, which comes from state wildlife grants from the federal government, and Wyoming’s general fund. “We aren’t using your hunting dollars, but we might use a little of your tax dollars,” he said. The one population of ferrets in Wyoming, in the Shirley Basin, is in a 10j-designated area, so the surrounding landowners are exempt from liability. The statewide designation would cover all landowners and the public. “That’s one reason we haven’t released any black-footed ferrets in a while, is because we have been concerned about the landowner issue. We’ve suspended a lot of our work with the ferrets until we can get extra reassurances,” Walker said. Walker said the agency’s commitment to managing prairie dogs hasn’t changed in areas where they need to be controlled. If the state gets to the point of reintroducing black-footed ferrets on private land, it will be by invitation only. They will work only with willing landowners, and no one will be compelled to host the black-footed ferrets. If the ferrets make their way to an area where they are not welcome, Walker said, they will be either left alone or trapped and removed, but the landowner can continue to manage prairie dogs in whatever legal manner he chooses. While some landowners, like Baker, are willing to work on stabilizing the prairie dog populations and enhance habitat for black-footed ferrets, others are still concerned about the resource damage and rapid population growth an unchecked prairie dog colony can accomplish.